1. Even as you arrive at Rangoon/Yangon, the capital of Burma, your eyes begin to feed your mind visions of a mystical place shrouded by the mists of waterways and jungle and the ancient ways of timeless cultures. Here is where the “magic hours” must have been born. For photographing any of the cities and landscapes and the lives of the people are magically enhanced at dawn and dusk, and into the twilight. There may be no better place on Earth to learn how to use this special light of the day. 2. 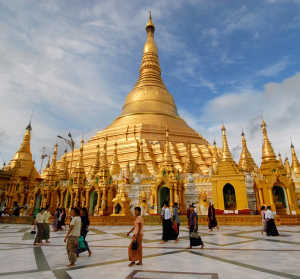 Amidst the modern hustle and bustle of this city of 5 million, all is dominated by the 1,420-foot tall, golden Shwedagon Pagoda situated at the top of Singuttara Hill. Reportedly 2,500 years old, nothing prepares you for the wonder and splendor of this most sacred Buddhist site. 3. Almost as compelling as Shwedagon Pagoda is the great Reclining Buddha, which is similar in size to the famous Reclining Buddha in Bangkok, Thailand. The Reclining Buddha of Rangoon can be approached, photographically, as a work of art, a spiritual icon and an opportunity to capture images of the people of Burma in reverent worship. 4. Although it may be difficult to turn your camera from these spectacular visions, the streets and markets of Rangoon echo with innumerable stories and are filled with thousands of faces. Find strategic locations from where you can capture both their exoticism and common humanness. 5. Your next vision is of the culture of the traditional Intha people, who live on and around Inle Lake. This second largest lake in Burma is situated at almost 3,000 feet altitude, which creates an incredible nature palette for any photographer. Of equal interest is how the Intha live, constructing stilt houses on the lake and growing and maintaining amazing floating gardens of vegetables and flowers. Immerse yourself and your camera into the midst of a lake-borne marketplace, with its myriad of still lives in produce displays and the lively interactions of the people. 6. Either you will feel transported into the ancient past or to an alien planet across the Galaxy when you first gaze upon the land of Bagan. In the early morning sun, more than 2,000 pagodas thrust into the sky, creating a landscape that can be found no where else on Earth. To enhance your vision and to give you a most unique photographic perspective, soar silently above this magnificence in a hot-air balloon. 7. The largest river in Burma, the Irrawaddy, flows through Bagan, adding new visions to your portfolio of this important waterway and the wildlife that lives along its shores. 8. As you travel southeast from Bagan, another vision begins to fill the horizon. It is the extinct volcano, Mount Popa, also known as the Mountain of Flowers. Almost 5,000 feet above sea level, Mount Popa is a place of pilgrimage for Buddhists, with the nearby cylindrical Taung Kalak hill, geologically described as a volcanic plug. At the top of this 2,400-foot feature is a monastery where all the 37 spirits, or nats, live together in a huge gallery. Not only will your camera find spectacular views across the central plains of Burma, but also the individual stories of the pilgrims, as you climb the 700 steps to the monastery with them. 9. These visions of Burma are available to a special group of photographers who join the Visionary Wild workshop, scheduled for October 24–November 4, 2012. 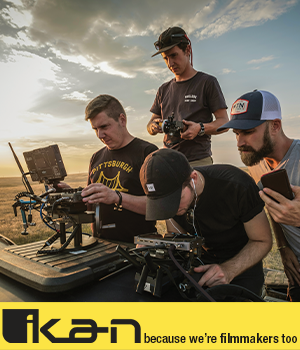 Your workshop leaders will be Karen Kasmauski, a renowned National Geographic photographer, having completed more than two-dozen major stories for the publication, and Justin Black, an equally well-known photographer and co-founder of Visionary Wild. Together, they will lead you through an unbelievable photographic adventure with the help of experienced Burmese guides. They will conduct structured group sessions as well as provide plenty of individual shooting time to explore the wonders of Burma. 10. A special highlight of Visionary Wild’s Burma Workshop is working with the Global Community Service Foundation to help build a bamboo stilt home for an Inle Lake family. Workshop participants will become part of the community for a short time and have many opportunities to take and to share pictures with villagers. Visit the Visionary Wild Web site for complete information at http://visionarywild.com/workshops/burma/#more-200.